The band, which includes Wet Wet Wet guitarist Graeme Duffin, played to an audience at the club on Hawick Street. Around 60 people attended the gig, billed as ‘An Evening with Ashton Lane’, on Saturday night. 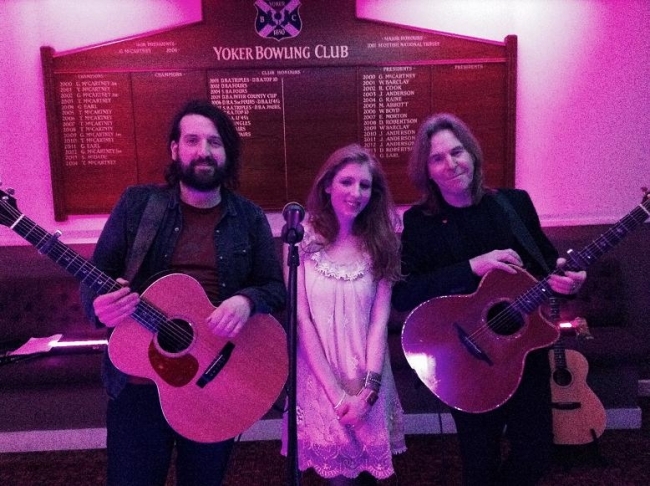 The band are a family unit — Esther O’Connor is the daughter of Graeme and wife to Tim O’Connor, both of whom play the guitar and sing backing vocals for Ashton Lane. They have recently toured Europe with gigs across Germany, Denmark and Norway. As well as that, they have appeared at T in the Park, V Festival and Celtic Connections. Their most recent album ‘Magic in the Air’ was released on the back of a tour of Nashville. Dalmuir singer-songwriter James McCracken supported Ashton Lane on Saturday. James is known for making it to the final TV stages of BBC’s Any Dream Will Do/Finding Joseph in 2007 but is better known for supporting Glasgow comedian Billy Porter. Organiser Gary hailed the night as a complete success. He said: “It was a privilege to host Ashton Lane, who have amassed millions of views on their YouTube channel in not just the UK but around the world. “We had to rely heavily on sponsorship and goodwill from various sources. We are grateful to Archers Sleep Centre for their commitment in sponsoring the gig from a very early stage. The band can be found by searching ‘Ashton Lane’ into Facebook and YouTube.